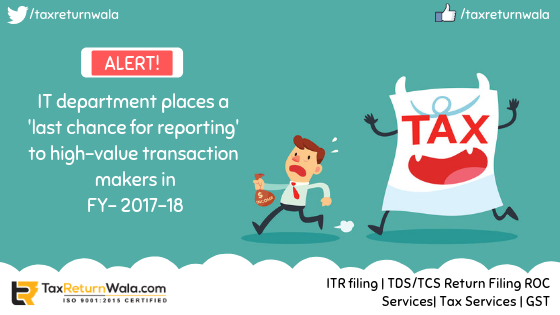 The Central Board of Direct Taxes (CBDT) has recently reported for several people who have undertaken big value transactions in FY 2017-18 and have not filed their IT returns. The department placed a last chance to all non-filers to file their tax return or an online response within 21 days beginning from the day of the of the said announcement. In the statement, the department quoted ‘Non-filers are requested to assess and report their tax liability for the AY 2018-19 or submit an online response to the department for non-filing within 21 days. If the department founds explanation so provided satisfactory, it may close the matter online. While, in cases where no return was filed or no response received, the department will take initiation under the Income-tax Act 1961. As per the quoted notification CBDT advised non-filers to not to approach any income tax office and to file only an online response at the web portal. CBDT also reported their observations of the analysis undertaken, stating – ‘that the department is able to identify some non-filers according to some information and reports available in their database. The sources concluded information for many unreported transactions also, including non-submission of tax deducted at source, TDS, foreign remittance , exports, and imports. Step 1: Login to the Compliance portal of the department located at (https://compliance.insight.gov.in). Step 2: To view Information details as stored in the department database under the e-verification menu on the compliance portal. Step 3: To file, if not yet filed a return on the e-filing portal after paying due taxes. If return submitted already, details are to be filed under ‘Filing of Income Tax’ head of the compliance portal. For those who were not liable to file a return can submit an online response. The department claims it to be a last chance to all non-filers who didn’t file their Income details for the AY 2018-19, this has been done to bring out transparency and to reduce compliance cost of people who have already been issued a notice and to those who can be observed later by the department.